Vacation rental cottage. Sleeps 7, 3 bedrooms, 1.5 bathrooms. Dogs allowed. View of Livin' the Dream from Jones Avenue. This shot shows the covered carport and great deck at front entry. Welcome to Livin' the Dream! Deck is a great place to enjoy Mermaid Morning Bliss coffee or evening cocktails! Livin' it up at Livin' the Dream! Great deck for enjoying outdoor meals, morning coffee or evening cocktails! Bright touches flow even to the outside of the cottage! Some more fun shots of the outdoor deck! Plenty of seating for everyone! Side exterior and yard - Livin' the Dream. This side of cottage faces Jones Avenue. Side exterior, yard and carport - Livin' the Dream. Another view of Livin' the Dream from Jones Avenue. Livin' the Dream outdoor shower. Livin' the Dream in this unique, fun bright house! Another view of living area. Dining area and fireplace. Seating for 8. Fun colors! View of living area/dining area. Cute corner nook! Love the blue chairs! Turquoise blue & white beach cottage kitchen; what could be more fun!!! Another kitchen view showing washing machine. View from kitchen into entry hallway. Another view of dining area/fireplace. Another view of dining area. Bedroom #1 with king-size bed. Another view of Bedroom #1 with king bed and built-in dresser. Bedroom #2 with one queen bed. Another view of Bedroom #2 with queen bed. Another view of Bedroom #2. Has queen bed and built-in desk. Full bath; notice the cute blue chandelier! Bunkbeds in Bedroom #3. Full bed on bottom, single on top. Another view of bunkbeds. Full on bottom, twin on top. Another view of Bedroom #3. Has bunkbeds with full bunk on bottom, twin on top. Another view of bunkbed room. Another view of Bedroom #1 with king bed. Charming beach cottage located on Jones Avenue! 3 bedroom, 1.5 baths. Great new and private outdoor shower with hot and cold water! Sleeps 7. 1940's cottage with lots of vintage charm! 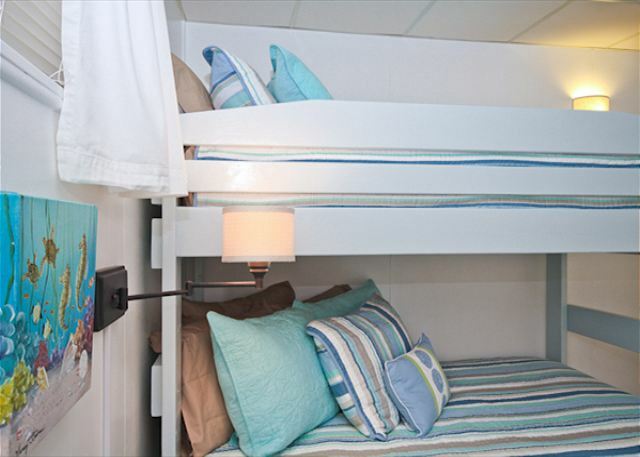 1 King bed, 1 queen bed, 1 double bed and a twin (double & twin are configured as bunk beds!) Perfect for a family with kids! Handicap-friendly with wheelchair ramp. 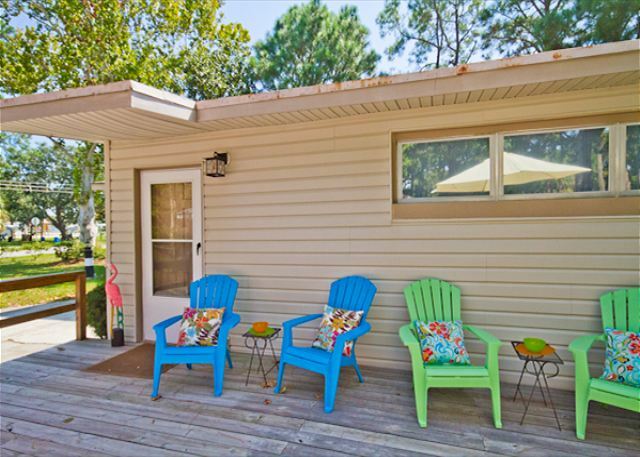 Bright, cheerful and newly-renovated and just 3 short Tybee blocks from the beach! Livin' the Dream is a one-story bungalow with a very spacious deck; deck offers lots of seating for enjoying cocktails in the evening or Mermaid Morning Bliss Coffee in the morning! Flat screen TVs in the living room, king bedroom and queen bedroom. Dining table that seats 8 comfortably with fun, orange chairs and another cute, aqua table with pink & green chairs & separate bench. This table makes a great workstation/playstation for laptops or kids’ play. (It's a great space if kids need a separate place to dine.) Also makes a great area to spread out goodies and snacks for everyone to enjoy! Living area very spacious with beamed ceilings, large flatscreen TV, comfy sofa, ivory slipcovered chair and two great wicker side chairs separated by a darling aqua/cream striped table. Plenty of seating for all; very cheerful, beachy colors! Cottage has been decorated in tones of aqua/orange/pink/red/ivory and captivates with beachy bold color! This color palette is followed throughout the cottage and it is truly a gem. Completely renovated/redecorated throughout with fresh paint, linens & great built-ins in the bedrooms with lots of counter and storage space! Lots of fun, beach & coastal pictures throughout lets you know you are “on vacation at the beach!” New tile flooring throughout. The bungalow has a very open, spacious layout and the bedrooms are also very spacious and inviting. The kitchen cabinets have been updated in a bright, beachy turquoise/aqua and kitchen is fully equipped including our very own Mermaid Morning Bliss Coffee! Washer and dryer located in the kitchen area. Full bath with shower in hall and half bath in the king bedroom. Covered carport is great! Can park out of the weather. Entry door from carport opens directly into the kitchen area. There is plenty of parking area in the carport and driveway. 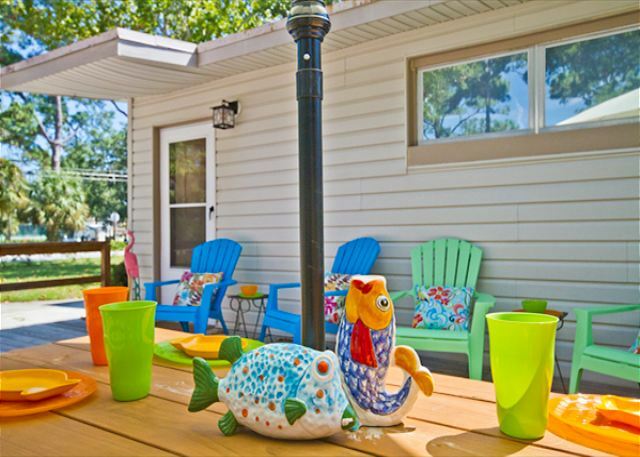 Livin' the Dream is directly across the street from other Mermaid Cottages (The Shrimp & Key Lime Parrot); great for families and large groups needing multiple cottages; very close and can walk back and forth between these 3 cottages. Blues Away Cottage, Mimosa Cottage and Maddie’s on Jones also nearby. Livin' the Dream is located directly across Jones Avenue from Memorial Park and the Tybee YMCA. Park features lots of picnic tables; great for group gatherings and multi-family gatherings. Also has a beach volleyball court, basketball courts, and an awesome playground! All located right across Jones Avenue from Livin' the Dream! Complimentary WiFi. Family Dogs Welcome, Family Games, Pets Welcome! We love visiting Tybee Island and Mermaid Cottages. This cottage is in a great location and has lots of room for a family. My grandkids thought it was great and loved the playground and fire station across the street. Lots of parking and a nice deck area. They even had some toys, books and puzzles for the kids! Hi Peggy, You have just enjoyed one of my favorite family homes!! All because of the park and the way the owners tried to think of even the kids with supplying the house. So glad you enjoyed it! Come again soon for more Tybee time, Mermaid Denise and the Mermaids! This house accommodates people in wheelchairs which allowed our son to enjoy our family reunion. We used this house as our central location for meals, games, hanging out together. Can't Wait to Coome Back! Spent 2 wonderful months at livin' the dream. Wonderful home, perfect for my family. An easy walk to beach and on the north part of the island which quickly has become my favorite. Mermaids provided one of the easiest vacation rental experiences I have ever had. Would love to visit again. Very spacious rental. Great outdoor deck and shower! My family and I had a wonderful time!! We had a great time staying in Tybee—a slow paced beach town that hasn’t given in to commercialization hype. Same holds true for this cute mid-century home. It has everything you need to have a relaxing family vacation. It also has great proximity to the beach. We had a wonderful time on Tybee. This area is calm and quiet even though the house is on Jones. 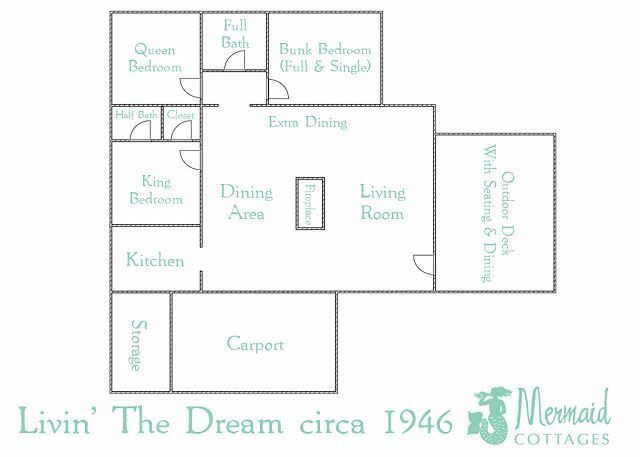 This is a lovely spacious vintage home with plenty of room for dinning, games and movie time. The outdoor shower was roomy and had hot water. I never did shower inside! The house was immaculately clean which is important to me as a clean freak. Our beds were very comfortable too! We walked over to 6th Street for beach access-a short walk. The park in front of house provides green space and offers lovely walks. The Mermaids provided superior customer service. Livin’ the Dream is a lovely house in a great location. Well equipped, clean and comfortable. We had a relaxing and enjoyable stay. My only comment would be is that there could be more lighting in the living room and dining room. A little darker than a beach house should be, in my opinion. We had another house rented for Spring Break for our daughter and she wasn't 25 so the other agency wouldn't allow her to stay. We received Mermaid Rental's number from a friend and they were super helpful and worked great with our daughter. Great place to stay for a weekend that included a get-together with long-time friends and an afternoon at The Georgia Conservancy's Annual Oyster Roast. A Special Place We Got to Call Home! Our experience at Livin the Dream was more than we could have ever asked for. It was a perfect temporary home that our whole family loved. Better than the home was our experience with Mermaid Cottages. They are by far the most professional and courteous vacation rental company I have ever dealt with. If you are considering a trip to Tybee (and you definitely should) I highly recommend using a Mermaid Cottage! 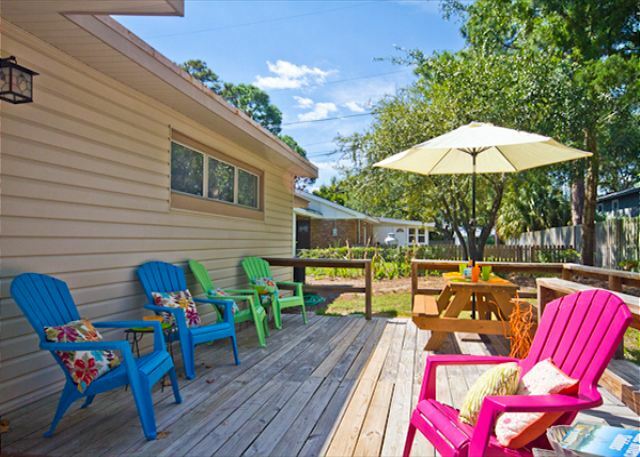 Living the Dream was the perfect place for our family and friends to stay while on Tybee. Denise from Mermaids was super helpful and made sure we had everything we needed. The cottage was very inviting, and it had all the comforts of home. Our youngest is in a wheelchair and she was able to get all around the house with ease. The outside shower was amazing! And we all used it after the beach!! The beds were super comfy and we slept like logs after our long days at the beach! We were totally livin' the dream!! I love this house! So spacious, yet still cozy. It was very clean and our dogs loved the yard. And one of the most well-equipped kitchens I've ever seen in a rental. Seriously, this place had all the perks. Fans, board games, and big tables for a puzzle. I will definitely say here again! P.S. As always Mermaid Cottages took great care of us with nice check-in calls. I love y'all! The cottage is great and we enjoyed our stay here. Beds slept great and we have stayed at other places not Mermaid Cottages where the beds have been uncomfortable.The cottage was clean when we arrived. The deck/patio is a great outdoor space and the charcoal grill was utilized during our stay. We hope to be back next year at Livin the Dream. We made some great family memories. We loved the house! It was spacious and the outdoor area was a great place to hangout. The location was perfect; it is walking distance to a few beach access points so it was very convenient. Wonderful Week at Livin' the Dream! This home was perfect for us. 5 adults and 1 baby stayed here. The house easily accommodated all of us. We also had family that was staying in Savannah and often had up to 10 adults for dinner. The outdoor and indoor seating accommodated us for all of our social interactions. The location was ideal, an easy 3 block walk to the beach. Our rental experience was nothing less than perfect! The house was in amazing condition. Me and the girls said all weekend the pictures just don't do it justice! It was perfect for our girls weekend. Just a short walk to the beach, and the shuttle to Savannah. I want to give a big thanks to Jennifer for always calling and checking on us, and also giving us the best tips for our stay in the city! Not only was she kind, she was more helpful than anyone I spoke with the whole vacation. She went well above her duties to make sure our stay was perfect, not just at the home, but the experience as well. I would recommend this to anyone an everyone! We have stayed at Livin the Dream several times. It is always a great time for us.Tybee is a special place. It is relaxing and easy to get around. Two areas of concern this trip were a slowly draining sink in the 1/2 bath and the shower curtain being too short causing water to pool on the floor in the full bath. I have no doubt that we will be back,but hope these issues might be addressed. Visit to my childhood home. We had an awesome week at 305 Jones. We rented 401 Jones also and had all three of our children and their spouses with us for a mini reunion. They all wanted to visit "grandma's house" again. We spend days visiting Savannah and Tybee, eating at our old favorites. Nights were spend around the large table playing games and putting puzzles together. We had a blast. very nice was a short trip and everything was as expected. We stayed here with our 4 kids and we absolutely loved the cottage! It was close to the beach and any thing else we needed. It was the most comfortable beach stay we've ever had. We had a great stay in "Livin' the Dream". This is our second year in a row staying in this house and we feel at home. The family enjoys the quick access to the beach and quiet stay at the house. Lived the dream at Livin' the dream! This property is located a short walk from the beach on the north end of the island. It was a perfect location for beach time, and a short walk to the grocery store. The home was well equipped for mealtimes, including pie and cookie baking! The bedrooms were spacious enough to place a portacrib in each. Indeed we took 3 babies under 21 months to Tybee and still had a great time! The outdoor shower was wonderful for cleaning off prior to coming in the house. We visited the lighthouse, farmers market, attended a family wedding at the Main pier and many shops. Spent a delightful day in Savannah which is a short drive away. We cannot speak to area restaurants as with a toddler and pair of 3 month olds we did not visit one! Yes, you can thank us for that. We hope to make this an annual visit. Enjoy your time at Tybee Island, the Mermaids will take good care of you! The description was spot on. Livin the Dream was clean, comfortable and location couldn't be beat. Just a few blocks to the beach and about 1 mile from the pier and shops. Lighthouse Pizza was delicious and Seaside Sisters was an amazing shop. We loved the peace and quiet and had a relaxing vacation. Thank you Mermaids....we will be back. Thought we would miss the screened in porch but did not. The deck was just fine. It was spacious and pretty clean and no bugs. We loved the TV's in every room and the location of the cottage. We want it next year so we'll be in touch. Because of allergies and previous bad experiences with other companies, we usually look for properties that are pet-free. But we decided to roll the dice and stay at Livin' the Dream and couldn't have been happier! The house was perfect for our family and had everything we needed for a great week, with plenty of room for everyone. The floors need a good cleaning and the top bunk bed was full of sand, but otherwise everything was clean and comfortable. Just what I had hoped it would be!! We enjoyed the beautifully decorated cottages, the neat and cleanliness . Thank you for letting us experience the stay without worry of any needs. The location and quality were outstanding!!! Our experience was great!We also loved the outdoor shower and that the beach is within walking distance. We enjoyed the house very much. Spacious and walking distance to the beach and shopping. Love the outdoor shower and that we can bring our dog! We plan to be back next year! It was a great house, big living and dining space. The bedrooms were very nice. We will request this place on our next visit. Our dream home on Tybee! This was our third stay at Livin' the Dream, and we're already making plans to return as soon as possible! 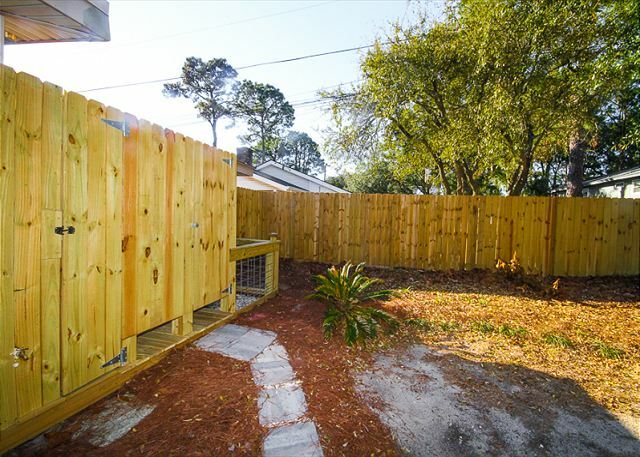 We love the home's layout, the outdoor shower, and the fact that we can bring our furry children on vacation. Mermaid Cottages management are so great to work with and always have a person on-call in case we have a question or concern. We had a big group so the living and dining area were great for our down time. We enjoyed living' the dream. It had all of the essentials and was nicely decorated. It was clean and the staff was friendly and helpful. We enjoyed staying at Livin' the Dream. The home was larger than we expected and we enjoyed being inside and outside on the porch. Would be great for a family too. Convenient location. Lovely home. Lovely beach. Wonderful people everywhere. Especially Mermaid Jan. Fire Lady April and her crew of outrageous firefolks. And, of course, the Mayor. Y'all come for the beach. Let the Staff at Mermaid Cottages and the locals take care of the rest. Salty and Sandy Memories for Everyone! This house is amaZing!! So close to the beach, big comfy bedrooms and outdoor shower is so fun. My kids loved the toys!! It was so clean and open feeling. Very nice property and Mermaid Cottages totally rocks! Awesome experience from the first phone call to reserve, all the way through check-out. If I had to nit-pick a bit, I would ask for a vent hood over the stove, and for the dining room to have a light fixture centered over the table. Minor issues though. The house was extra clean, furnishings great, and the beds comfortable. The outdoor shower is fantastic. We will definitely rent from Mermaid again. Oh, and the coffee is super tasty. I bought some from Seaside Sisters to bring home with me. Livin the Dream Cottage truly lived up to its name! We arrived to a fresh clean cottage, thanks to Beth Johnson. There was space for the grandchildren to play and for the adults to gather as well, and our family dog, Benton, enjoyed the fenced yard and deck. We enjoyed our walks to the beach and sitting on the deck in the early morning and evenings. We will have many memories of our Livin the Dream Vacation to cherish as a family. This is our second time renting Livin' The Dream. We will be back! This is a great cottage -especially if you have a pet! The house is comfortable. We really like the outdoor shower! Lived the Dream for a week! We had a wonderful time! The house was beautiful and accommodating for my entire family. Tybee was awesome as usual! We would definitely stay with Mermaid cottages again! Mermaid cottages were fantastic! First all the staff at Mermaids could not do enough to help they went above and beyond! The cottage was just delicious and perfect and Tybee was purely magical! We will be back! Thank you Mermaids! Another great week at Tybee. And another wonderful vacation rental from the Mermaids. This was a great rental. The location was perfect. Best outdoor shower so far! Very comfortable and very clean! We love Tybee. Walked with our 4 legged child. Rode bikes, hung out on the beach and ate amazing food.. We will be back! This is the second experience with Mermaid Cottages . Both experience have been wonderful . 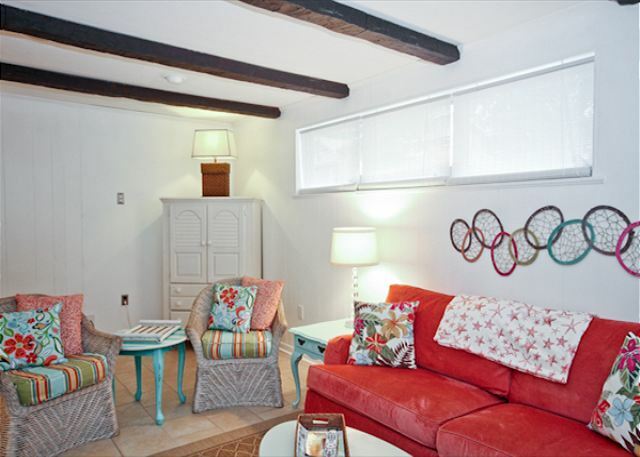 The cottages are decorated so cute and have all the accommodations that any family would need for their stay . We are very picky about where we stay due to cleanliness , but they passed the test ! We will never book anywhere else ! We had a great time taking our 8-month-old baby girl to Tybee! The cottage was decorated so cute and our stay was very comfortable. It was an easy way to the beach...we were pleasantly surprised to find a heavy duty stroller in the closet which helped immensely on our strolls to and on the beach(: also was a high chair! We also loved the outdoor shower! Though there is only one shower in the cottage, the outdoor one is so spacious and the water pressure is great so I never even used the indoor one. We definitely want to visit Tybee and stay with Mermaid Cottages next year! The "Mermaids" attempted to call multiple times during our visit to make sure things were great, although I was always away from my phone when they would call, it was comforting knowing they were available and cared enough to check-in. We booked the Livin'the Dream cottage for a week because I had a triathlon in Tybee. The family felt at home with plenty of room for the family and dogs. The house was clean and comfortable. Nice short walk to the beach and it was only a mile from my race. I was able to bike to the race. We enjoyed our rental! It was great! Close to the beach, plenty of room, decorated wonderfully. Surprises included a pack 'n play, high chair, toys, baby monitors, and jogging stroller. Only cons were the AC didnt cool very well during the 90 degree temps and the floor needed to be professionally cleaned. Other than that, the rest of the house was spotless! Loved the outdoor shower! Livin' the Dream was a delight! Spotless, and cheerful! Our 2 dogs loved the fenced in back yard. The park is just across the street and it is a short walk to beach access. The local grocery is well stocked though we enjoyed the local diners as well. Breakfast Club has wonderful food, and we also enjoyed the Crab Shack! Tybee is so relaxing compared to other beach destinations .. everyone is friendly and it is easy to navigate. Thanks to the expert Mermaids who made our vacation fabulous! Our son and his girlfriend really enjoyed the Dolphin sunset tour.. and did I mention the glorious beach? We will be back! This house was so bright and cute! It was the perfect location for our Saint Patrick's day weekend. We will be back. Our first stay in Tybee Island was made exceptional by our accommodations in this adorable cottage. The space was beautifully decorated and had all we needed for our stay. The only recommendation would be to outfit the kitchen with a few more of the essentials for cooking as we enjoying staying in for our meals. Hope to visit another Mermaid Cottage in the future! Loved this was a bright spot in our rainy and cold weekend at Tybee! The reservation process was easy and rapid. Questions were answered by the "mermaids" promptly, Loved the turquoise and pink and green colors everywhere. The candles on timer made a lovely evening atmosphere. The cottage was well-equipped, including a highchair and fun toys for kids. Be aware that there is no bathtub which we found to be a bit of a problem with 2 little kids. The location is an easy walk from the beach and just across the street from a great playground! It was exactly what we wanted. Lots of space, close to the beach. Quiet. The outdoor shower was awesome and very useful. And there were lots of friendly dog amenities so we will be bringing our pet next time. The whole experience with Mermaid Cottages was very pleasant and we will be using them again. We loved "Livin The Dream", as it was very convenient to the beach and most of the establishments. The thing we were most unhappy about was the cleanliness of the tile floors. They were swept, but not mopped. Every time you walked across the tile floor barefooted, your feet would be dirty, so we learned to walk across the floor with our flip flops on. Another thing was the drain in the shower would become clogged. We had to get the plunger to unclog the drain. It could use a good dose of drano. Overall, we had a good experience, and I would recommend "Livin The Dream". we had a lovely time on Tybee Island. The house worked out great. We enjoyed a few visits to Savannah, and the beach, went to Ft.Pulaski,kayaked with Sea Georgia. Was disappointed in a few things: the bike rental companies were both very unprofessional, the dog park, and the lighthouse is closed on Tuesdays (what??) I had called and gone to Tim's Bike Shop and reserved bikes for the next day. When I arrived they had given my bike rental to someone else. I would suggest to anyone going to tybee that wanted to bike to bring their own. I would recommend Livin the Dream to anyone with dogs it worked out well. This property was in prime location with just a short walk to the beach/places to eat. Our family had a wonderful time and will be back again! A perfect place to rest our heads and feet while walking and exploring all Tybee Island had to offer. Thanks Mermaid Cottages for making it so special for all of us! This house was great for our girls weekend! 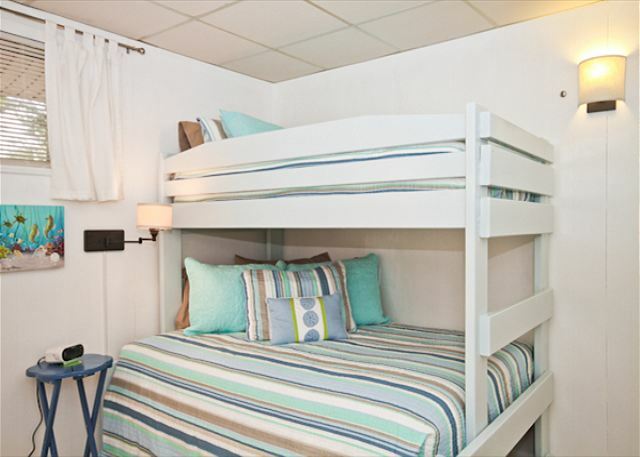 My favorite things were the fun colors, comfortable beds, plenty of space, walking distance from the beach, and was very clean! The only thing I would have changed is better outdoor living space, but that is so minor when you have the beach a few blocks away. Will definitely rent from Mermaid Cottages again! the rooms are a little dark, but we had so much room for us and our kids and the interior was very pretty. We loved our weekend at Living the dream! First visit to Tybee Island, and we loved it. The island was laid back with a nice beach. The house was perfect for our family of five (boys shared the bunk room, daughter in the pink room). Also, dealing with Mermaid Cottages was so nice. They really value customer service and it shows. Overall, great vacation experience. The cottage was perfect. All of the colors makes it such a happy place. It was perfect for our family of six, as well as our two dogs. We loved it!!! We had such a wonderful experience with Mermaid Cottages! I was shocked at how sparkling clean our cottage was! All of the furniture was excellent quality and in great condition (with the exception of one extremely hard queen size bed). The furniture in the common areas was luxuriously comfortable. The linens were amazing! Our only complaint is that the stove and oven cook unevenly. But the kitchen was so well-stocked it made up for it! It made for some interesting meals. But what a lovely gathering place! We had a wonderful time. The staff was so friendly, and the accommodations so welcoming. I am now a Mermaid Cottages customer for life! We had a few days to get away and Tybee was our destination. "Living the Dream" was dog friendly and available. We are so glad that we chose this home- perfect for us. We recommend this home to others. In Tybee for a wedding. It was my 1st time there. The propert management company was very helpful with the booking and other questions. We plan to visit again. Both houses we rented were comfortable and furnished and decorated perfectly. Can't wait to stay with Mermaid Cottages again! I got married at Tybee Island and my family stayed here at the "Living the Dream" cottage. We all loved it very much. We had family that were also staying at Tybee for the wedding and some had never been to Tybee before but EVERYONE fell in love with the cottage. I had searched and looked at all the pictures that of the Mermaid cottages and they are just all too cute. The house was clean and it had everything we needed. There was plenty of sleeping and dining room for our family. I can't wait to stay with Mermaid Cottages again! Comfortable. Can't wait to go back! Loved staying in "Livin The Dream." The cottage had everything you could need and the layout was great for a larger family. The location was perfect! Can't wait to visit again! This cottage was in a great location. We could walk to the park, the stores, and restaurants. It was well-equipped with a stroller, high chair, and several toys for my two boys. I loved the layout of the cottage. The two large tables made it easy to play puzzles and games at one and eat at the other. We loved the colors and decor of the cottage. We have stayed at Mermaid before, and as always, we were very satisfied. Great space to vacation! Lots of room, nice outdoor area, and minutes to tje beach. If you are thinking about staying here do yourself a favor and do it! Perfect for our family of 4 adults and 2 children. Cottage has adorable furnishings, so bright and beachy! Having only 1 1/2 baths could be a real problem in summer with everyone needing to shower at once for dinner but since weather was cool, we didn't have that problem. 1/2 bath sink slow to drain and floors could have used steam cleaning. A bit farther from the beach than what we would have preferred but for spring break, it was perfect! May want to spray yard for sandspurs. They were awful! We would definitely stay there again. Nice to be "livin the dream" for a few days! We LOVE the beach!! The house was perfect! The house has enough foom for the whole family! And the lady who makes the reservations was awesome! Thank you! We loved the cottage. It was spotless. The location was a problem because of our dogs. I knew ahead of time the property was not fenced in but we didn't realize the cottage was on a busy road. We had to have the dogs on a lease at all times. We had a great time. Loved the park across the street. Would rent from mermaid cottages again! The cottage is very pleasant and well is very closed to the beach.